With over 100 jazz and music instruction videos on YouTube, Aimee is becoming a highly-sought-after teacher and clinician. Here are some words of praise from fans around the globe! “Her voice is full of poetry and worldliness. Her production is wrapped in a musical ball of emotional delivery. Right away, I know she is a songwriter. 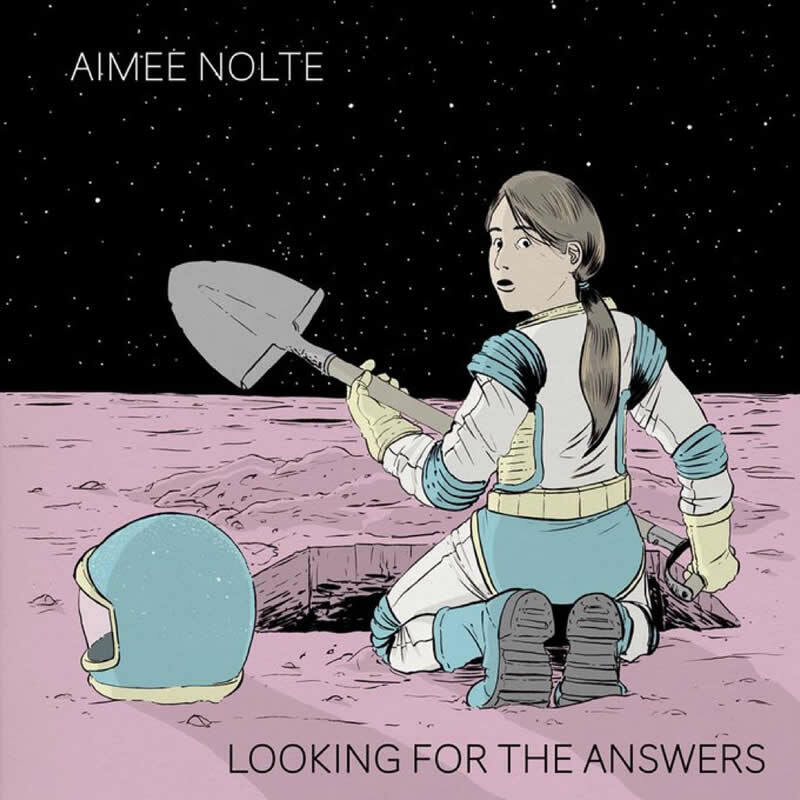 After listening to only a few tracks, I am certain that Aimee Nolte wrote these stories from her heart and she’s probably playing piano. I look in the liner notes to discover I’m correct. She’s a composer and a pianist; a producer, arranger and a poet. Hi Aimee! I wanted to thank you for being the best teacher anyone could ever ask for. You've demystified jazz for a random young person from India with literally no background in it, and been my strongest guiding voice in the subject for a long time now. You're so inspiring to other young women in jazz, and thank you for all the great ways in which you make the world better for a lot of people. You make me confident that teaching jazz is an incredible career because so few people know how to do it sincerely, thoroughly and patiently. Cheers to you and sending lots of love from Bangalore, India. I've been trying to learn jazz piano for a while now after over 20 years of classical piano... read so many books... watched videos... but your channel is the firs one which really makes me get it and breaks it down so it's accessible and understandable. Thanks so much for alla the time and effort you put into making your videos and helping us Jazzers learn the craft. Aimee, I just watched the video of your analysis of Remember Me again and you bring me even deeper into the beauty of the composition the second time. Not sure how many times I will be able to watch it again, running out of tissues. You are amazing in so many ways. Your analysis of Remember Me is without a doubt the most moving tribute to Robert and Kristin Lopez that any song writer could hope for. If It was me I would treasure your presentation of their work much more that I would the Oscar. You showed all of us how much you love music as you lead us through the cathedral of Remember Me. A wonderful piece of work by you showing us all what real composition is and should be. Bravo! When I pass from this world I would love to have you signing Remember Me just as you did at the close of the video. Reaching for the high notes showed your true love and emotion for the song. This piece presented me with the strongest musical learning experience I have ever had. Well Done. As somebody who had almost given up on the piano (after many interruptions over many years), I have been completely remotivated to start again after coming across Aimee's videos. I can totally agree with your analysis of what makes up this perfect set of attributes. In addition to rational analysis, there are also these less easily defined features in her presentation that make watching it such a delight. Being a slow learner and not particularly gifted (read: very unpromising) I have watched some videos over and over again, and at the n-th time I'm still thoroughly enjoying it and learning from it. She is obviously a gifted musician and a professional in her art as well as a natural teacher. At the same time she is fun, intelligent, a tomboy and a loving mother. What a combination! And not to forget (but you mentioned it) a hard worker! I'm amazed at how many presentations she has on Youtube. I could go on, but Aimee also seems to have a knack for working with all the latest technology, installed in her own room or, in portable form. (combining gracious S-turns on a skate board with a totally meaningful chat about music!) Multi-tasking, I suppose. Hi Aimee! I'm new here but this has already been a life-changing discovery for me. I have seen quite a few of your videos already and they are all SO gut. I have totally returned to the piano, even though I had practically given up. This is so motivating, that you are almost overcoming my many limitations. I believe that I'll soon be able to do your New Orleans licks. But watching you playing, improvising, jamming and teaching is simply heart-warming and incredibly motivating. I was taught classically but didn't get anywhere (much as I like listening to it). What you are showing us is a different dimension that (I'm let to believe) I might eventually learn to inhabit. On the fringes, at least. Mustn't get ahead of ourselves. I'm writing this having just watched you and Gianna Pedregon. I loved it! Seeing you communicating with other through music is a wonderful thing to behold. There is so much of that radiating out of your videos. Whether you are on a skateboard, talking about music (you are a spell-binding narrator!) or presenting "your very useful" daughter Ella's scales game. "Keep practicing", she said "and you might become so good as my mum". I subscribed immediately. Aimee! I'm so happy to support talented people who are being so super-generous with their time, expertise and knowledge. I wanted to say - your musical talents and the hard work behind them are really obvious to any viewer, but beyond that you have developed a great pedagogical style well-suited to youtube, which is no easy feat. Your lessons are well structured and provide entry points to both beginners and more experienced musicians, you find ways to make what is essentially a "one-way" communication very interactive (loved the audience participation on the Top 25 Jazz Standards to Know video! ), and you are able to create a sense of connection with people you can't even see, which is quite remarkable. I thought it important to acknowledge that and I let you I appreciate it, you're doing really nice work and I know it's nice to hear when people recognize it! When I watched your video about picking out chords from a song, I thought, "Teaching others through this medium is as natural as breathing for her." You are doing what you were destined to do. That's beautiful. Congratulations. Hello Aimee - I have to say, I absolutely have to thank God for you. You have made my life easier and less stressful. The way you explain things are so easy to understand and what I called the "mystery of jazz" isn't so mystery anymore. My instrument is piano and I only started about 7 months ago. I have no musical background whatsoever and at this point in my life, I'm being exposed to a lot of music, mainly jazz, but also classical and other genres. But jazz captivates me the most. I attend a community college and they've assigned me a private piano teacher but she teaches classical piano and it's cool and all. I needed more though. I wanted more expulsion so I can pick up on a lot of things quickly and I stumbled on your channel 3 weeks ago. I couldn't be more happier in my life. Your energy is what caught me by surprise and it made me stay and the way you went about teaching things and just wow! The first video I watched was where you are explaining the tritone substitution. I learned immediately about the tritone sub and I just kept watching your videos and I spent a whole day dedicated to watching your videos. It has helped me so much and I'm just sending you this message to thank you. I'm truly thankful. I pray that you continue to prosper in your love for music and also that you continue to flourish as a human being. Hi Aimee, you´re doing a great job with your lessons! Thank you very much for that! I took your bassline-concept to play a lot of standards and guess what: my family - two kid and my wife . are starting to sing those tunes. i.e. Yardbird suite and they love it. Before I would use chords in my left hand, but with the walking bass the tunes come across much better. Thanks and keep up the good work! It´s awesome! I´ve never learned so much in such a short time.I´m looking forward to more videos from you. You made me look at my instrument and music a new way. I´m singing the licks and this is great, at least for me, because I´m not great singer. And what I can sing, I can play! Old rule, but true. Would be awesome to get your sheet of „Killing me softly“. This is a great video, Aimee. Just be yourself and play what's in your heart. Best advice you can give (a musician). An important life lesson that's not easily learned. Aimee, would you forgive this Englishman for being so gushing with his praise but I adore you! I was such a lazy student way back when (and long before you were born) but at 55 years of age, I have returned to the piano with a genuine passion for leaning Jazz piano and your lessons are just the ticket. You break things down to their simplest components and the theory - so perplexing to understand in a plethora of other videos on YouTube - becomes so crystal clear and easy to understand! Happy Christmas and thank you so much for so generously sharing your knowledge with an old codger like me!